The humble beginnings of Green Mountain Coffee Roasters all started in the beautiful mountains of Vermont. In 1981, a man named Robert Stiller stumbled upon a little known coffee company while on holiday at a Ski Resort in Waitsfield. This small, speciality coffee store caught Stiller’s attention with a cup of coffee so good, he was left with no choice but to buy the place. As Green Mountain Coffee grew it formed an environmental committee in 1989 to guide them on conservation issues that has remained strong within the company until present. Green Mountain Coffee Roaster Inc. was officially formed in 1993 and started opening its doors to the public in September of that year. During the period of the 1990’s, Green Mountain Coffee® started heavily backing a coffee company that we all know today as Keurig®. 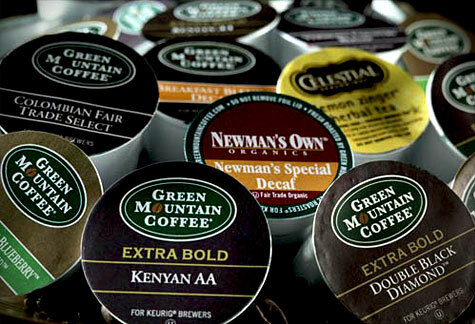 In 2006, Green Mountain Coffee® finally completed its purchase of the single-cup brewing manufacturer. The convenience and compatibility with a wide selection of Green Mountain coffees lead to the K-Cup® exploding in global popularity. The coffee pod can now be found in both home and office environments across the world. As the company grew tremendously, Green Mountain Coffee® became a recognised leader in the coffee industry. Not only was this company’s claim to fame its award-winning coffee, but its social responsibility practices that changed the game of fair trade coffee. Here at The Coffee Delivery Company, we stock a vast range of Green Mountain Coffee® K-Cup® pods to bring you, our valued customer, gourmet coffee tastes and aromas from around the globe. From medium roast’s like the Breakfast Blend and Colombian Fair Trade Select to the Organic Sumatran Reserve Extra Gold dark roast. We also stock light roasted blends like the French Vanilla Flavoured and Hazelnut Flavoured for those who want to explore more exotic coffee blends. If you are interested in our range of Green Mountain Coffee® K-Cup® pods, please do not hesitate to give one of our friendly customer service team on 0330 123 3309.